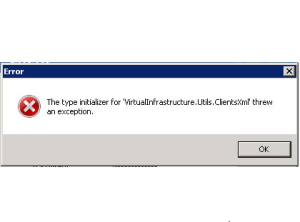 Podczas logowanie za pomocą vSphere Client otrzymujemy błąd: The type initializer for ‚VirtualInfrastructure.Utils.ClientsXml’ threw an exception. Błąd VirtualInfrastructure.Utils.ClientsXml w vSphere Client. Błąd An unexpected server error occurred. Please try again.